I finally found some time to get a "shop" set up at Artfire. I hope to get some new things listed there shortly. Now that I've got that taken care of I really want to dive into some new fabrics and come up with some new patterns and sew!! Speaking of new patterns, I randomly went to the thrift store yesterday and found a big bin of sewing patterns (Center of Hope in Oxford). Talk about a time capsule! I found patterns from the 50's and 60's in various states of "falling apart". I plan to go back some time and sift through them in hopes of finding one or two that are intact. I think it would be cool to sew some vintage style dresses. In looking through some of the stuff in the bin, I came across a pattern that had the following disclaimer printed across the front "not suitable for chubby girls". Ha! Boy, things have changed. Also, I plan to order the book Sew What! Bags by Lexie Barnes. 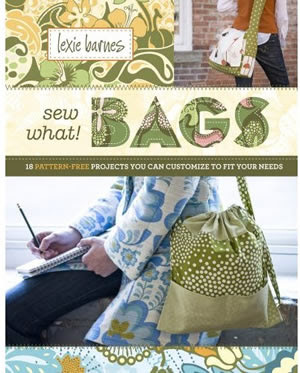 I checked it out at the bookstore and it has lots of great purse, tote, and other projects. The instructions look simple and easy to follow. I can't wait to get started on a new bag. I am a total purse addict. That is the final vestige of the "before baby" me and I'm not letting go of that! And I am a firm believer that a woman can never have too many purses! Especially moms. Well, nap time has finally come and I'm going to go sew. My mom has all the patterns from when we were little and I use them all the time for my girls! The instructions are so much more clear and I also love the retro/vintage styles. I also have adult patterns from my Mom and Grandmother from the 50's, 60's, and 70's they are awesome, too! Good luck and good hunting! I didn't get any that day. . . guess I was intimidated by the word "facing" on all the patterns. But I will be braver next time. I love those styles and if you say the patterns are easier to follow, I will give it a shot. I have bought two patterns from Hobby Lobby and they gave me an instant headache. Why do they make something simple so complicated?!?! ?